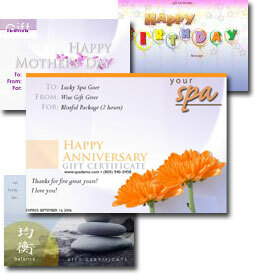 SpaBoom's client base now exceeds 1,000 day spas, massage therapists, medical spas and estheticians. The significant and rapid growth equates to in excess of an eight-fold expansion during the freshman year of the industry's premier Instant Online Gift Certificate provider. SpaBoom's growth also demonstrates nicely that the national trend of taking business online clearly applies in the beauty and wellness sector as well as more traditional areas. "Most spas out there have invested to develop a website, understanding that potential clients look to the Web when they're seeking a spa service," said Bill Bice, SpaBoom's founder. "But that's only the first step. We've brought an extreme focus to increasing overall spa revenue via our Instant Online Gift Certificates, which essentially monetize what before was an attractive yet passive Internet face for the spa. We make their website pull its weight so that spas can focus on providing clients the relaxing settings and rejuvenating treatments that keep them coming back for more." Recent holiday sales prove that SpaBoom's formula is working. Spas sold significantly more this holiday season, and all noticed a significant reduction in the stress related to last-minute gift certificate purchases. Traditional gift certificate fulfillment, typically a time and staff-consuming task, no longer factors in to SpaBoom spas' gift certificate sales formula. In essence, SpaBoom spas enjoyed greater overall revenues while avoiding the stress typically associated with peak sales seasons. The prospect of improved efficiency coupled with increased revenues will certainly help incent SpaBoom's next 1,000 clients to empower their websites to perform at a much higher level in 2007. SpaBoom helps spas take full advantage of their online spa marketing efforts by providing instant online gift certificate functionality and management, appointment requests, and Spa Emergency, their national online directory of spas offering instant gift certificates. Simply put, we're here to make your website work as hard as you do to build your business and boost your bottom line. To learn more, please visit http://www.spaboom.com.